1-1 overall last night, dropping the Best Bet on the Panthers First Period Moneyline but hitting the Lightning Moneyline as Tampa overcame a 4-1 deficit to beat the Blackhawks in a 5-4 OT thriller. Ironically, the very day we decide to cut back on posting leans on every game because it’s been a tough month, the opinions we posted on the 4 other games went 4-0. Tampa’s win and Carolina’s point for an OT loss (the Canes scored in the final minute of regulation to secure that point) further tightened the very intriguing playoff race in the East. The Bruins and Lightning are respectively 1 and 2 points behind the Leafs for the third Atlantic Division spot, while the Lightning is 1 point behind Boston for the second wild card spot, with the Islanders 2 points behind the Bruins and the Hurricanes 4 points back. Over in the West, the 8 playoff teams have basically already been determined, but the seedings are very much up in the air. Calgary is the first wild card but still has a realistic shot at winning the Pacific Division, along with the Ducks, Sharks and Oilers – who are all within 3 points of each other. The Blues are currently the 8th seed in the West but are 1 point behind Nashville for the third Central Division spot. With so many teams still having so much to play for, it should be a compelling final couple of weeks of the season. There are 11 games in the NHL tonight! Our favourite bet with a writeup is below, followed by leans on 7 of the other 10 games. Good luck if you’re tailing along on any of them. It’s pretty obvious who the more desperate team is here. Carolina’s within a few points of a playoff spot while the Red Wings are all but mathematically eliminated from post-season play for the first time in ages. But that didn’t matter last night as Detroit upset the heavily-favoured Hurricanes in OT, almost pulling off the job in regulation time before Carolina tied the game in the final minute of the third period. So what’s changed since last night? Detroit’s energy level. The Wings have to be running on fumes here, and not just because this is their third game in 3 days (a scheduling irregularity caused by a postponement of a game between these two teams earlier this year). Detroit’s also played 4 straight overtime games (and 5 in its last 7), plus the Wings are playing their 9th game in 14 days. We love the way the Wings have been fighting lately (2 goals or less against in 5 of 6 games, and going 5-1-1 in their last 7) but Detroit was outshot pretty badly last night (42-27) and that should only get worse tonight as they’re even more tired. The Hurricanes offence is firing on all cylinders right now (3+ goals in 7 straight and 4+ in 4 of 6), and if Carolina considers itself a playoff team, this is a game they should expect to win in regulation time. Reasons to bet Nashville: The Predators have won 7 of 8 games, are 7-1-2 in their last 10 and are 4-1-1 in their last 6 versus Boston. The Bruins have been limited to 2 goals or less in 3 of their last 4 games. Reasons to bet Boston: The Bruins have won 5 of their last 6 home games versus Nashville. The Predators are playing for the second straight night and 4th time in 6 days. Reasons to bet Winnipeg: The Jets have won 3 of the last 4 meetings and 5 of 7, including a 3-2 win over the Devils Nov. 29 in Winnipeg. New Jersey has lost 20 of its last 27 home games. Reasons to bet New Jersey: The Jets have allowed 3+ goals in 8 of their last 10 games, and could be without Laine and Byfuglien. Reasons to bet Buffalo: The Sabres have won 4 of their last 5 games, with the 1 loss coming against the Penguins. Columbus has scored 4 goals in its last 3 games and 11 goals in its last 5 home games. Reasons to bet Columbus: The Blue Jackets are 27-10-1 at home this year and have limited opponents to 1 regulation time goal or less in 4 of their last 6 outings overall. Columbus is playing on 2 days rest while the Sabres are playing for the second straight night and 3rd in 4. Reasons to bet Ottawa: The Senators are 21-14 on the road this season. Philadelphia has lost 13 of its last 16 games following a victory. Reasons to bet Philadelphia: The Flyers have allowed just 4 goals in their last 3 games and are coming off a 6-2 win Sunday in Pittsburgh. Ottawa has scored 1 regulation time goal in 5 of its last 7 games, winning just 2 of those 7. Reasons to bet Dallas: The Stars are playing much better defence lately, allowing 2 regulation time goals or less in 4 straight games and 5 of 6. Dallas has gone 4-1-1 in its last 6 games. Reasons to bet Montreal: The Canadiens have limited opponents to 1 goal in 6 of their last 10 outings. Dallas is 0-5 in its last 5 games when playing for the 4th time in 6 days, and Montreal has won 7 straight when playing on 2 days rest. Reasons to bet Florida: The Panthers have scored 15 goals in their last 4 games and Toronto is without No. 1 netminder Freddie Andersen due to injury. 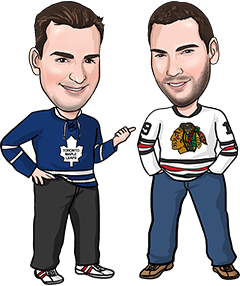 Reasons to bet Toronto: The Leafs are 7-2-1 in their last 10 games and held opponents to 2 goals or less in 8 of those 10 games. Florida has allowed 4+ goals in 3 of its last 5 outings and has just 15 wins in 37 road games (15-14-8). Reasons to bet Washington: The Capitals are 5-0-1 in their last 6 games, a streak that started with a 4-2 win over Minnesota March 14 in Washington. The Wild has lost 8 of its last 9 games, has allowed 4+ goals in 5 of its last 10, and is playing its 11th game since March 10. Reasons to bet Minnesota: Even though the Wild is slumping, they’ve held 5 straight opponents and 7 of 9 to 27 shots or less. Washington has lost 7 of its last 9 visits to Minnesota. Reasons to bet Los Angeles: The Kings can’t afford any more losses as they enter action 11 points out of a playoff spot with 8 games left. Edmonton has lost 13 of its last 19 home games versus the Kings. Reasons to bet Edmonton: The Oilers have won their last 2 meetings with the Kings after LA won 21 of the previous 26. The Kings have been shut out in 2 of their last 3 games and scored 2 goals or less in 6 of 7. Reasons to bet Anaheim: The Ducks are 6-0-1 in their last 7 games and 8-1-1 in their last 10. Vancouver has lost 10 of its last 11 home games and is coming off a 5-game eastern road trip. Reasons to bet Vancouver: The Canucks are 18-13-6 at home on the year while Anaheim is just 15-15-7 on the road. Reasons to bet New York: The Rangers are the best road team in the NHL, having won 20 of their last 26 games away from home. San Jose has lost 6 straight games and allowed 13 goals in its last 2 outings. Reasons to bet San Jose: The Sharks have more to play for, battling for first spot in the Pacific while the Rangers are locked into the first wild card spot in the East. New York has lost 5 of its last 7 games and is 1-6 in its last 7 games when playing for the 3rd time in 4 days.